Crème brûlée is a popular dessert in both Italy and the United States. The recipes are varied and almost always have very imaginative names. A famous American chain of housewares and gourmet packaging presents the description of the recipe and a small tool that produces a flame that can caramelize the surface of the cream. In Florida, some restaurants combine crème brûlée with exotic fruits. The recipe that I propose is a variant that I have developed of this classic from French cuisine. The realization of simple desserts requires you to figure out the cooking time according to the characteristics of your oven. The first time you have to check your dessert and if necessary continue to check every 5 minutes, noting how long it takes to bake. This dessert is delicately sweet yet very substantial, suitable for children or people who need a lot of energy. The eggs used in the recipe must be fresh. The crème brûlée should be stored in the refrigerator. Pour 1 liter of water in a saucepan and bring to a boil. While the water is heating, prepare the cream. Beat the egg yolks with the sugar until they are soft and creamy white. Heat the milk and bring to a boil. Turn off immediately. Add cream eggs, grated rind of citrus fruits, cinnamon, and vanilla. Pour in the milk slowly, stirring with a whisk. Heat the mixture for a few minutes without bringing to a boil, stirring constantly, otherwise the cream will curdle. Pour the mixture into individual molds. Place the molds in a large baking dish or two if they are small. Fill the bottom of the pan with hot water until it reaches a height of three quarters of the molds, taking care not to wet the cream. Cover with foil and bake at 350°F for 40 minutes. After this time, control by touching the cream with a finger, it must be firm. If it is still liquidy, check frequently and continue cooking. When the molds are coagulated, remove from oven and let cool. 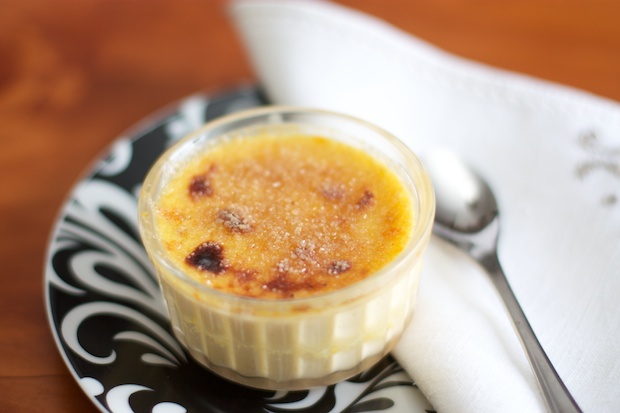 Before serving sprinkle a bit of can sugar over every crème brûlée, turn on the broiler in the oven and allow the sugar to caramelize for a few minutes.